In late October 2008 in northwestern Afghanistan, six members of a Marine Special Operations Team were minutes away from being overrun by Taliban fighters. Surrounded by a larger enemy force, the Marines had called for air support, but dense cloud cover over the valley the Marines were trapped in was making it impossible for Navy F/A-18s to reach them. For a minute, it looked like all would be lost, until two A-10s arrived, flown by pilots who risked their own lives to save the Marines’, just as night began to fall. The narrative below is based on official statements from Marines in addition to an extensive interview with one of the Hog pilots, all of whom might not have lived to tell the tale. It was late in the afternoon on October 28 when Marine Special Operations Team-5 (MSOT-5) was conducting a combat reconnaissance patrol in the Bala Murghab District in Badghis Province, along the Turkmenistan border. MSOT-5’s mission was to confirm the presence of Taliban or Al-Qaeda fighters in the region. Six Marines along with an Afghan interpreter and an Afghan soldier had split off from another group of Marine special operators shortly after leaving Forward Operating Base (FOB) Todd to make their way close to a small village to observe the activity. The team had reached their limit of advance and were about to complete their mission when the Taliban attacked in mass. Heavy small arms fire and a swarm of rocket-propelled grenades quickly descended on MSOT-5. Cut-off from the other Marines who were just several miles away, MSOT-5 was heavily outnumbered by a force determined to kill them. Moving quickly under intense fire, the small group of Marines and Afghans quickly cleared a compound, seeking shelter inside a single building and immediately setting up a defensive perimeter. The team’s JTAC, or Joint Terminal Attack Controller (call sign HALO One-One), got on the radio to initiate higher prioritization for close air support. Four U.S. Navy F/A-18 Hornets would soon arrived above the valley, at that point covered in a blanket of clouds thousands of feet thick. The Marines were hoping to fight off the Taliban until nighttime arrived, and then use the darkness to escape, but as the sun began to slowly set, the Taliban continued to press their attack. The Taliban fighters also set up PKM and DShK heavy machine guns to pound the compound. The MSOT-5 chief later estimated that the building in which they were using as protection was hit by over 20 RPGs; many of the walls, as a result, began to crumble under the withering fire. As the integrity of the building began to fail, MSOT-5 was forced to move to just a few rooms of the building that could be defended. Around 325 miles away, two A-10Cs had just completed a three-hour mission and were setting up to return home to Bagram Air Base, the sprawling facility north of Kabul, the Afghanistan capital. But a refueling plane quickly met up with the A-10s as they redirected towards the firefight, piloted by Capt. Jeremiah Parvin and First Lt. Aaron Cavazos, of the 75th Expeditionary Fighter Squadron. Once the A-10s got to within 50 miles of the Marines location, they began to hear communications from the orbiting Navy Hornets. The Hornets had been unable to penetrate the weather deck that encompassed the valley and mountains around the area where the Marines were fighting for their lives. The Hog pilots checked in with the Hornets who provided a quick handover, checked off station and turned toward their carrier which was operating in the Arabian Sea. It was now an A-10 only mission. The situation on the ground for the Marines had only gotten worse in the hour and twenty minutes it took for the Hogs to arrive. Taliban fighters had made at least three dedicated efforts to breach the building the Marines were in, and combat was often muzzle-to-muzzle. The Marines were forced to drop grenades out of windows to slow the Taliban advances. Taliban fighters, meanwhile, were raising their AK-47s above their heads, holding them into open windows and spraying the room full of bullets. In his official account, the Marines’ chief said, “I could have literally reached out windows and touched insurgents on the other-side.” The wounded Assistant Team Leader encountered a Taliban fighter in a hallway who was armed with an AK-47 and RPG, who he quickly dispatched. Cavazos, the A-10 pilot, who was later awarded the Distinguished Flying Cross for valor, told me what happened next. “As we got closer to the Marines position, we began to talk to the JTAC and he described their situation as being in the middle of this valley below us, which we could not see through the cloud cover. They were pinned down inside one building within a village compound. At this point, they were basically in hand-to-hand combat, trying to keep the Taliban from breaching their position. How these guys survived this long I have no clue. A plan was made to penetrate the cloud layer into the valley, as the JTAC had estimated that the cloud layer dropped to 3,000 feet above the ground. But the A-10 had no radar to guide them, no local maps, and no real way of safely penetrating the weather and avoiding the mountains surrounding the valley. The JTAC, though, told the pilots that the valley ran north-to-south and their location was right in the middle of it; the decision was made to fly into the valley heading north, descending slowly toward the coordinates of the firefight, hoping the description of the valley was accurate enough. “Of course, all of this happened at twilight,” Cavazos explained. “This just made things even more difficult. Parvin went first with me slowly in trail. As he got under the weather he radioed to me, ‘I am under the weather and there is a firefight and I can see everything.’ The sun was just touching the horizon as I dropped into the clouds and began my descent. There was a lot of false shadowing, and all the dust and water vapor just accentuated the shadowing more. The problem with this was that once you could get under the weather it would be very easy to bite off on false horizons or false peaks, leading you to think you are clear but really about to hit a mountain that is in the shadow of another mountain. By going “Christmas tree,” the pilots turned on all the exterior lighting on the A-10, easily marking their locations for each other. 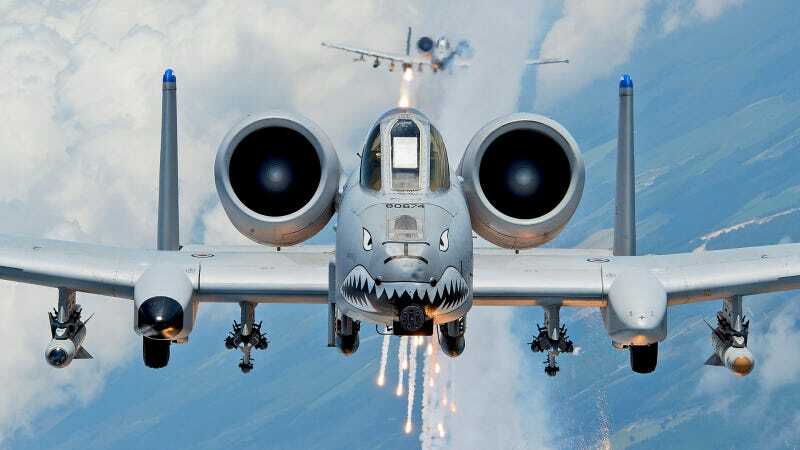 But the Taliban took notice as well, making the A-10s an instant target for Taliban fire, which was also what the pilots had hoped for. If the Taliban were firing at them, they were no longer firing at the trapped Marines. “We were happy to have them fire at us instead,” Cavazos recalled. During the first 25 minutes there, each pilot made seven strafing runs with the A-10’s powerful 30mm GAU-8 cannon. At times, the Hogs were firing within 30 meters of the Marines position. With the tight confines of the valley restricting a lot of their flexibility, the A-10s were forced to used daytime strafing maneuvers in the darkened valley, putting them well within the effective range of the the Taliban’s deadly DShK heavy machine guns, which also became targets for the A-10 pilots. Cavazos destroyed three and Parvin got a fourth. And as the A-10s began to eliminate some of the threats, the Marines were able to fight off fighters who were trying to breach their position. As the rate of enemy fire slowed, the Hogs made low show-of-force flybys, hoping to draw enemy fire which they did, allowing them to identify their positions and attack. The Marines turned on their strobe lights on top of their helmets as they made their move, visible as a sparkle to the Hog pilots through their night vision. Their movements were marked and with a clear line of sight the A-10s could engage the Taliban who were close behind and chasing them down in the darkness. Marine special forces in Afghanistan. US DoD photo. As the Marines egressed, the A-10s flew directly at them, shooting the 30mm rounds over their heads at the Taliban who were in close pursuit behind. As Cavazos said: “While they were in the building it was easier to shoot that close to them, 40 to 50 meters or so most of the time. But once on foot it was a little more hairy. After the Marines made their successful egress from the compound they regrouped with other members of their team they had been separated from, eventually returning to FOB Todd. The A-10 pilots stayed overhead, using their targeting pods to continue an over watch.